Breeders Fund award winners for 2017 have been announced, and a total of $525,000 will be distributed among 53 different thoroughbred breeders. 248 Virginia-bred victories were recorded from 2,231 starts, which translated into $3,926,079 in purse winnings. Highest money earning breeder was the Keswick Stable & Stonestreet Thoroughbred Holdings at $70,631 thanks to three time stakes winner and top bonus money earner last year, Stellar Wind. The 6 year old Curlin mare collected a trio of Grade I stakes wins in the Clement Hirsch, Apple Blossom Handicap and Beholder Mile. 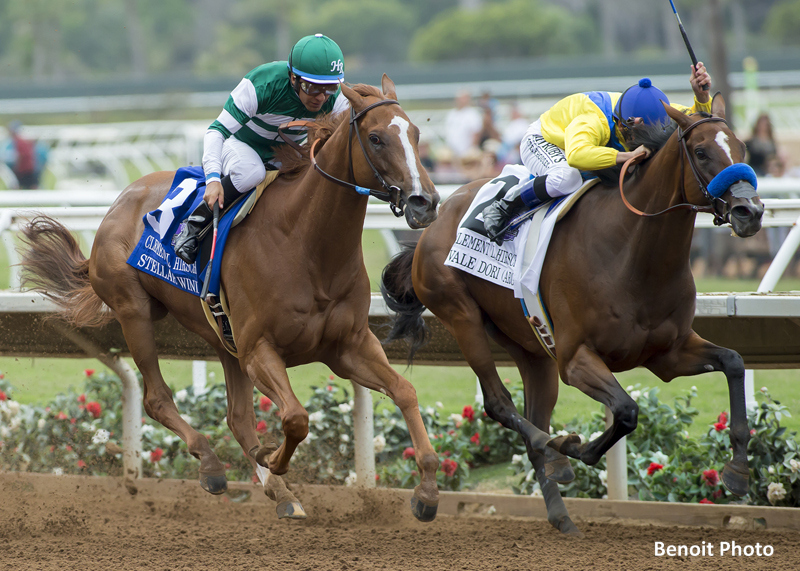 Stellar Wind earned a capped bonus of $25,000 each from the last two, and $20,631 from the first stakes win. In 2017 Stellar Wind won $800,000 in purse monies, and her career earnings now stand at $2,253,200. The leading breeder by sheer number of wins was Mr. & Mrs. C. Oliver Iselin, who had 35 individual awards that totaled $69,447. Their American Dubai was one of two Virginia-breds that had five wins in 2017. The 5 year E Dubai horse’s triumph in the Downs at Albequerque Handicap produced a $13,066 bonus alone. He also prevailed in the Sunland Park Handicap and totaled five wins from ten starts last year, good for $332,310 in earnings. Mr. & Mrs. Bertram Firestone were next with 22 wins. 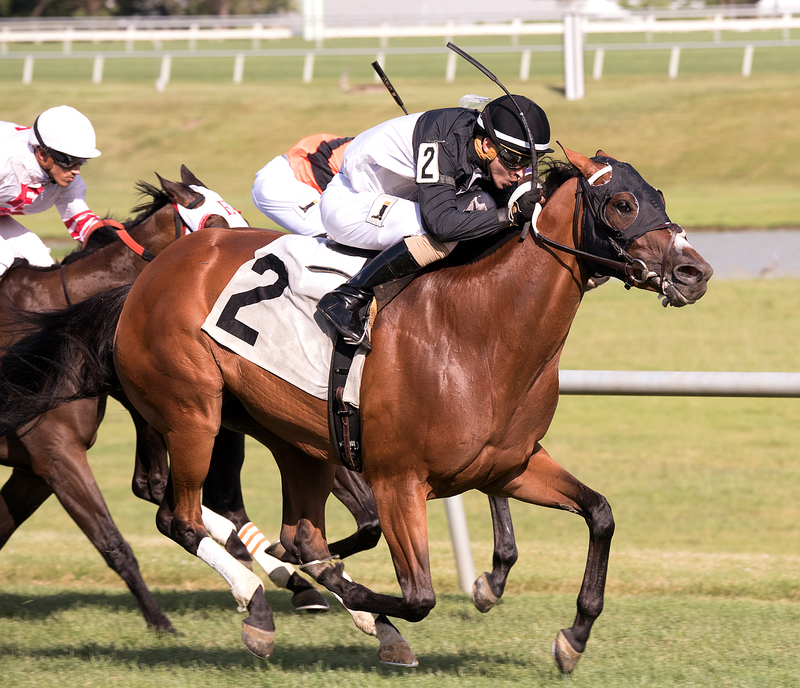 Their 7 year old Stroll gelding, Special Envoy, won a three pack of Virginia-bred stakes in 2017 — the Edward Evans, Hansel and Bert Allen Stakes. The combined trio of efforts added up to $14,349 in bonus monies. He completed the year with $129,510 in purse earnings, and has amassed a career bankroll of $287,650. Special Envoy turned the tables on Rose Brier as the two battle to the wire in the Edward Evans Stakes. photo by Jim McCue. Morgan’s Ford Fam was third highest by wins, with 20. Four of those came courtesy of River Deep, who was bred in conjunction with F and F Stables and won $119,300 in purse monies from nine starts last year. Queen Caroline had wins in the Nellie Mae Cox and Brookmeade Stakes, both for Virginia-breds, and each resulted in a bonus of over $4,000. The 5 year old Blame mare earned $115,318 from eight starts and now has $375,613 in life earnings. Larry Johnson-bred horses reached the winner’s circle 18 times including Do What I Say, who scored in the Commonwealth-bred Tyson Gilpin Stakes and generated a $4,900 bonus. The 5 year old Street Magician mare has bankrolled $114,935 from just nine starts. Johnson’s Greek God had four wins, Porte Cochere connected three times and Street Miz chipped in with a pair. 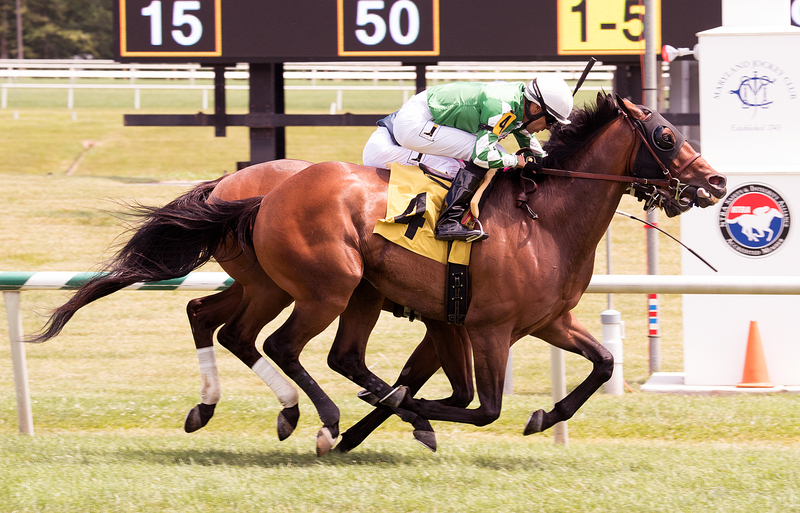 Do What I Say captured the inaugural Tyson Gilpin Stakes June 24th at Laurel. Photo by Jim McCue. 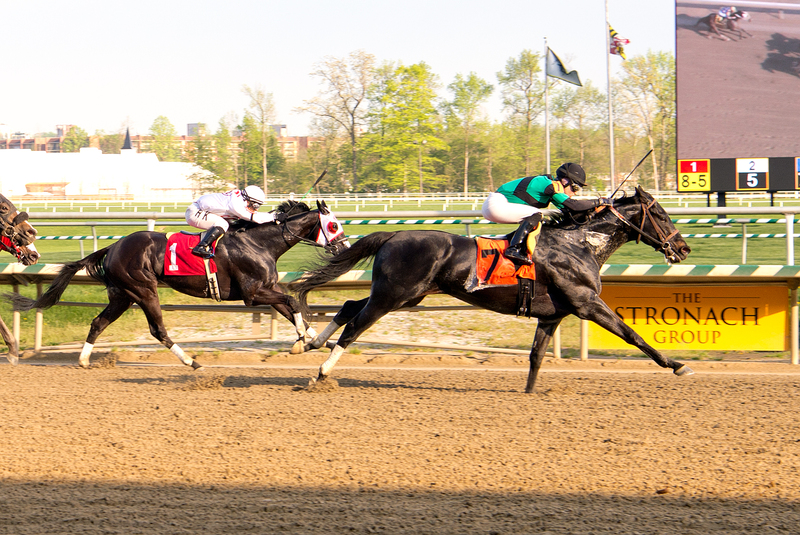 The William Backer Revocable Trust was fifth with 17 wins, followed by Lazy Lane Farms (13) and Audley Farm Equine (11). The Backer-bred West End Gambler had three triumphs to complement a pair each from Nice Try and Alabama Slim. Lazy Lane’s Rapid Rhythm won two stakes in 2017 —the Mardi Gras and the Richard Scherer Memorial — good for over $7,500 in combined bonuses. Audley Farm bred the impressive Greyvitos, who was named Remington Park’s Horse of the Year. The 3 year old son of Malibu Moon earned a $25,000 bonus from a win in their $400,000 Springboard Mile. Greyvitos earned $306,345 from just four outings. Another horse in the top ten by award winnings was Just Call Kenny, who captured the Philip Iselin Stakes at Monmouth. The 7 year old son of Jump Start was bred by Althea Richards, won twice in 2017 and had four additional “in the money” finishes from various stakes. He earned $197,830 last year and has accumulated $479,565 in his career. 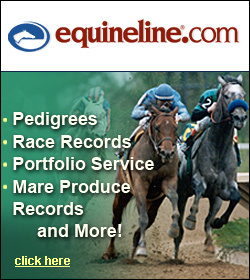 Just Call Kenny, bred by Althea Richards, won by 1 1/4 lengths over Double Whammy April 21st at Laurel. Photo courtesy of Jim McCue. Five different breeders shared $25,000 in stallion awards from a total of 20 wins and $298,290 in purse money earned. Phyllis Jones netted the highest amount, collecting $10,762 in awards from four wins via their stallion Friend or Foe. Those victories were by On the Fringe and Mr. Buff, both with two each. Lady Olivia at North Cliff was next with $8,449 from seven wins courtesy of their stallion Cosa Vera. Rounding out the top five were Susan Minor ($3,981- Fierce Wind), Sara Collette ($1,006 – Xenodon), and Lazy Lane Farms ($805 – Hansel).